Most of you probably didn’t notice because I’m sure you were working or studying or something, but fall practice for the 2015 edition of the South Carolina football team started today. There is always this tremendous build-up to the first day of practice, and then a long, laborious trek to the opening game. This year, the month of August will be even tougher since Steve Spurrier announced all practices will be closed to the public. Then I think he said he would open a scrimmage, or two, and maybe a practice here or there, or not, unless he changes his mind…well, just stay tuned, but for the purposes of this post let’s assume the vast majority of practices will be closed. The yellow jersey – [insert names] were in yellow, non-contact jerseys today. Oh God, is he really hurt? How bad? Day to day? Those things can linger you know…who’s [insert name]’s backup? Can he play? HE’S IN A YELLOW JERSEY TOO?!?!?!? The Spurrier interview – HBC will call the media “boys”, make a crack about the weather, and then go on for 3-5 minutes about practice and somehow tell us absolutely nothing. Oh sure, you’ll see mood swings along the way and those might be the leading indicators of how the team is doing. But for the most part it will be like eating an entire bag of cheese puffs alone – satisfying while it’s happening, but ultimately just empty calories that still leave you hungry. 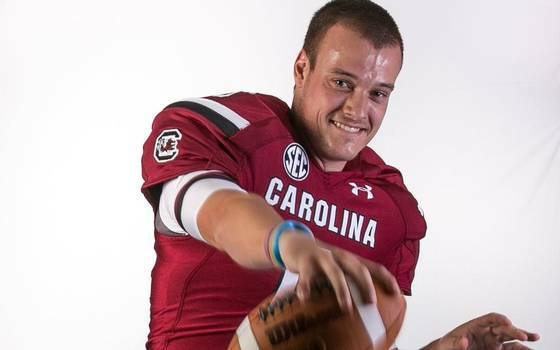 You may be surprised at what Steve Spurrier said about his newcomers. Want to know what was surprising about what he said? ABSOLUTELY NOTHING BUT YOU CLICKED IT ANYWAY. Nice work TBS. Josh Kendall (@JoshattheState) questions – Kendall will ask such long, winding, confusing questions to the players that all they will want to do is lie down and take a nap because it’s freaking hot out here. Interviews from Gamecocks Online – Since they control the media, they are the only source for these for about 30 seconds until every Gamecock site under God’s green earth repurposes them and posts them to their site as some sort of original content. Come to my site to see player interviews! No, over here! No fair, you went there last time! The announcement of the starting quarterback – NOW HERE IT IS, THIS IS THE ONE THING YOU SHOULD BE ON THE LOOKOUT FOR BECAUSE EVERYTHING ELSE IS JUST TIME AND SPACE FILLING NOISE. This is truly the only exciting thing that will happen for the next month barring something unforeseen. And we’ll go ahead and tell you it’s going to be Connor Mitch. And if it’s not Connor Mitch I’m afraid we’re in deep doo doo and you might want to wean yourself off of this team anyway. Game week – The week leading up to the UNC game will feel different, but it really won’t be. More non-stories filling your days and nights prior to someone actually putting a boot to leather and brain rattling skull to skull. So take heed of these nuggets fair reader, and then tear yourself away from the internet for a few weeks to finish that novel you’ve been working on, go for a walk with your spouse, or even toss the old pigskin around with Bobby in the back yard. We promise, you will not miss a thing. I already feel better about my life. It’s like a weight has been lifted and I can just do something productive.